For many small businesses, especially those based solely online, a website is the main port of call. For this reason it’s vital that your website is screaming the right message and showing a consistent overall style. This means that the layout, navigation menu, colour scheme, fonts, logo and copy are all aligned. 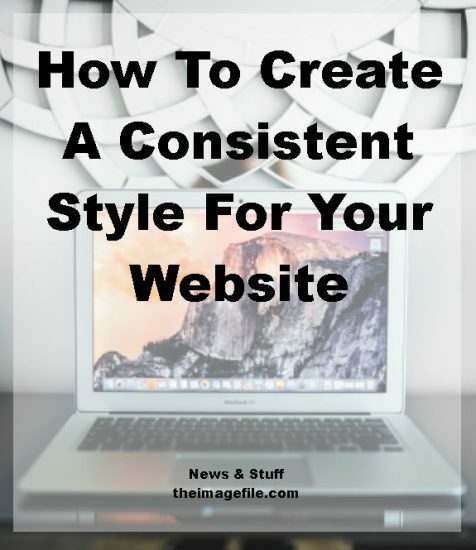 Here’s what to look for when considering the style of your website. Let’s go! Think of a brick and mortar premises. Whether it’s a high-end fashion house or your local coffee shop, the layout is vital for two reasons. The first is that it is the first impression a customer receives and therefore is the first deciding factor for whether they stay or go. Secondly, the layout of a business sets the atmosphere. For example, if you go into a book shop you will find that the shelves start from one side of the entrance and go all the way around the store to the other side with tables or seating areas in the centre and information/help areas sporadically laid out. This is so a customer feels welcomed. They are completely embraced by the business and are therefore encouraged to browse and linger a while longer, there is no rush for them to leave. On the other hand imagine your local Starbucks or Costa. It’s most likely an equally welcoming place, however the seating area is limited and is placed on one side of the shop. On the other is the sole counter which is long and thin encouraging people to queue in an orderly fashion. This layout seems more fast paced and encourages customers to order, drink and leave. These impressions also apply to a website. For example the “book shop” equivalent of a site might include large slideshows, multiple pages and copy laid out in an editorial way. On the other hand the “coffee shop” equivalent might be limited pages, limited images and a small amount of copy. Your navigation menu is equally important as it directs the customers experience. Most people click on a navigation menu from left to right so consider what order you want them to see things in. For example you might want them to go from your home page, to your about page, to portfolios, information and then contact. Or alternatively you might prefer your home page, portfolio, information and then a contact page. In the past we wrote a comprehensive article about colour psychology, however here is a brief overview. Your colour scheme speaks volumes to your clientele. Subconsciously colours mean a lot of things, for example red makes us feel rushed and energetic (which is why it’s used by fast food restaurants) whereas blue is considered dependable and trustworthy (hence it’s used by banks). Equally consider who you are trying to appeal to, for example women tend to be more drawn to pastels or bright pinks, yellows and blues whereas men tend to be more drawn to simple monochrome or natural colour palettes. We have also spoken about the importance of fonts in the past. There are two things to consider when choosing a font. The first is where you are intending to use a typeface. Generally speaking, serif fonts are the most popular fonts as they are the easiest to read for a long period of time, however sans serif typefaces are considered “cleaner” looking and are therefore used for headers and screen reading on a regular basis. Equally, if you choose to use a unique font, for example a more retro or calligraphy based typeface then be aware that if they are too strong they can be hard to read and distracting, so stick to using only one or two. Secondly, be aware that your typeface also adds to your overall style. For example we tend to recognise a lot of the serif fonts so associate them with a traditional style, on the other hand sans serif fonts have become increasingly popular over the past couple of years, with many businesses now favouring the very thin, clean-looking typeface. Therefore many people associate sans serif fonts with a contemporary, clean, sleek style. They are also sometimes considered romantic and soft, compared to the serif typefaces. Finally, unique fonts such as retro typefaces and calligraphy have made a massive comeback in recent years and could speak of a “new yet vintage” style. For example many companies now have a very hand-written look, especially when it comes to their logo. Speaking of logos, this is one of the most vital areas when conveying your style to your customer base. Your logo says a lot about the work you do, from what your business specialises in, to your personal style and target market. It also helps you stand out from the crowd. Once again consider the message you want to send to your target audience as well as your colours and fonts. For example the two logos below give a completely different message about their style. The one of the left looks sophisticated and traditional, whereas the other looks light, feminine and fun. Just to clarify your copy are the words on your website. Your copy is also one of the most vital ways of showing your style as it allows a voice to come through. Think about the personality of your business. Is it creative and bubbly? Or is it sentimental and romantic? Or perhaps even traditional and straight-laced? Whatever your business’ personality allow it to shine through in your copy. Do you think your website is a good representation of your business style?